Antiference aerials are tuned to work across UHF, Dgital and Analogue Frequencies. The RX 12 aerial provides a clear, strong signal due to its matched Dipole and tunes reflector. The aerial is suitable for use in medium to strong signal areas and all UK transmitters. 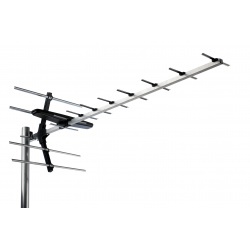 The RX range is a new generation of UHF TV aerials designed for the digital age. The unique double dipole balances the aerial's performance, delivering more of the signal at lower frequencies. Amplified indoor aerial for Freeview/HD and DAB with a built in amplifier to boost the signal accordingly up to 42dB. It also has built in 4G and GSM filters to minimise interference from other devices such as mobile phones. 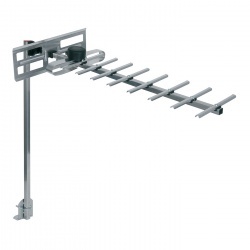 The aerial has 360 degree pick up and comes with a 1.5m CoAxial cable. The ideal range of the transmitter is betweeen 0-9 miles. 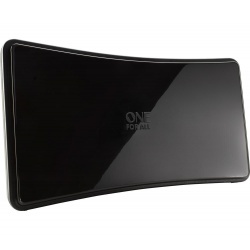 It has a highly modern curved design and finished in High Gloss Black. Comes complete with power supply.